Well our birdies are certainly joyful today! It is an absolutely gorgeous day here! We had 70 degree temps with hardly any wind! Woohoo! Today we took our kids on a little mini field trip to our supermarket and we couldn't have asked for nicer temperatures! It was a lot of fun to get out and take a walk, that's for sure! Anyway, I made this card for the Unity Celebration color challenge. I love this paper called "Sweet Slumber" from Stampin' Up! It fit the color challenge PERFECTLY! To go along with this challenge I also used the Mojo Monday sketch challenge from last week (yes I know I am behind). The bird is from the adorable Unity set called "Giggle Grove" and the sentiment is from the set called "Feel the Joy". Overall I really like how this card turned out. I know that I broke some serious rules by not adding string to my button but I just couldn't get it to look right! I just love how this card turned out. It's so fresh and clean yet pretty! :) I saw the Viva la Verve sketch from last Friday and new I wanted to play. I haven't been able to participate in these for quite some time because of how busy I have been so it was a lot of fun to join back in on the fun! I doubt I will be able to get them all complete before the end of April but I can at least say I got one done! Haha! Anyway, I made this card with either my mom or Nick's mom in mind (obviously). I was very distracted while making it (Nick and I were watching a Skulls) but it really turned out great! I also discovered that this month's Verve Project Parade is about celebrating the women in our lives and I have been in a Springy mood so it hit the spot! For the card I pulled out my brand new, absolutely fabulous stamp set from Verve called "Because of You" and paired it with my new paper from My Mind's Eye. I picked up this 8x8 pack of paper as well as another My Mind's Eye pack at Hobby Lobby last week when it was 50% off and I can't get over how gorgeous it is! You can't tell in the picture but it is very glittery, yet elegant. To add to the glitter I embossed my image with irridescent embossing powder and added some rhinestones around the circle. I also embossed the word mother at the bottom of the card. Well, that's it for me tonight. We had supper with our dear friends Leanne and Ryan tonight and Leanne cooked the most delicious meal! Nick actually got some on his shirt and he was licking it! Haha! I know, that's gross, but it was SO funny! Anyway, I have a very busy week a head of us so I had better get some honey time in. Have a wonderful evening! 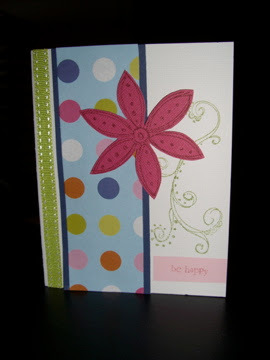 A Bright and Cheery Card...plus a GORGEOUS picture! Now would you like to see a new creation??? :) Here it is! I LOVE how this card turned out but what I love the most is how fast and easy it was to make! The paper I used is my new Girl Friday dp from Cosmo Cricket and the letters are from my newest set of Thickers! Yum! ;) This sketch is actually the SCS sketch from two weeks ago but I thought it was a fun and simple sketch so I decided to play with it. I added some old olive ribbon and a yellow sparkly flower with a button for some added embellishments and this card was complete! Well, I'm going to cut this post short so that I can get some more creating time in. I have had kind of a rough past couple of days and need to burn off some steam! I am sure you all completely understand where I am coming from! Have a WONDERFUL night ladies! I appreciate each and every one of you! I know, I know, I'm a bad blogger. Good evening! I have had one hectic week! I spent the weekend in Ft. Collins chaperoning a choir trip. We went to a dinner theater where we had the most amazing meal (with dessert) and watched an absolutely terrific performance of the movie "Seven Brides For Seven Brothers". If you haven't seen that movie, you should. It's a great movie! Anyway, the actors and actresses did such a phenomenal job! It was a great remake of the movie! I wish we could have taken pictures but we obviously weren't allowed to. The main character Adam looked almost identical to the one in the movie! So because I was gone, I haven't been able to get much stamping in so I decided tonight would be the perfect opportunity to play along with the There She Goes challenge. This month's challenge was to pick one of our first cards ever created and compare it to one of our recent favorites (preferable from There She Goes). Well, here we go! This is the first card that I ever created without any assistance from a workshop. I made this card in February of last year. Looking back I realize it wasn't too bad for having no experience on my own! Now here is a picture of my favorite card that I made THIS February! I must admit that I am amazed at how much improvement I have made in a year! I know that I couldn't have done it without all of the inspiration that I find from Splitcoast and other bloggers! 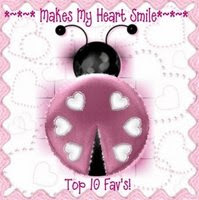 I have been influenced by so many talented stampers and they have helped shape who I am as a stamper! Well, that's it for me tonight! I hope to share a new card with you tomorrow! :) Have a great evening! So us Coloradians got a ton of snow yesterday and I wanted to share a picture with you! We probably got close to a foot here in the Westcliffe area but I know they got more in other areas. Anyway, here is a picture of the same church across the street from us. I took this picture when there was only about 6 inches on the ground from the comfort of my house! ;) After taking this picture another surge hit us and dropped quite a bit more. Well, that's all for this morning. I have a card that I will share with you later! Have a great day though! Good morning! I hope you are all having a glorious Friday! I loved being able to sleep in a little this morning after a long and stressful week. The sketch that Taylor has for us this week is really fun and simple. I wanted to use it for the Verve Release color challenge so I pulled out a piece of my Cosmo Cricket Everafter dp because we all know that I can't create a card without designer paper! :) The color combination that we were supposed to use was light blue, soft yellow, and soft brown. I decided that since So Saffron and Baja Breeze matched my dp, I would use those two colors as well as Kraft. Little did I know just how much of a challenge I was creating for myself! For some reason, I struggled to get a look I was satisfied with. I poked and prodded at this card until finally I decided it was cute enough. It's definitely not one of my favorites but I don't hate it either. The final touch that finally satisfied me was the sponging around the edges. I am just amazed at how much life it can bring to a card! For the stamps I decided to pull out my Verve set called Serenity and use the sentiment "Just Because" from my Fluttering By set. I also added some cute rhinestones, stickles, and ribbon as some extra embellishments. Make sure you stop by Taylor's blog to see today's sketch. Taylor has also picked Sandra MacLean for this week's featured sampler! Check out her blog too! I can't get over how beautifully Julee can make a simple Bible verse stamp look. I mean seriously! :) This is one of my absolute favorite verses (I know, I say that all the time) and I am thrilled at how gorgeous it looks on a card! You can find this stamp at the Verve site under the Plain Janes section. It is called "Psalm 51:10". Anyway, I used another one of the Verve Release Sketches and AGAIN pulled out some more Cosmo Cricket paper. This specific paper is from the "Hey Sugar" collection and it is so fun and funky! It has such an interesting color combination. Who would ever think to combine Ruby Red, Chocolate Chip, and More Mustard with Baja Breeze? Not me! Once I had it glued together though, I decided to embellish it by paper piercing along the striped strip and gluing on some buttons and flowers. Well, that's it for the card. I have had one tiring day. If I learned anything this week, it is that girls are mean. Period. Now, of course I knew it before this week, but what I didn't realize was how mean even 2nd grade girls can be! I have had more girl bullying in my classroom this week than I could ever have imagined! Today I even had some girls pick a fight with a 4th grade boy! Seriously! What they were thinking, I don't know. I just know that they are mean and I am tired of it. Literally. It makes me want to rethink having children...well...kind of. :) Enjoy your evening! Good evening everyone! I hope you all had a wonderful Wednesday! Doesn't it feel great knowing that the week is over half over? Actually...for me it is 3/4ths over because tomorrow is my last work day! Yippee! :D Anyway, I wanted to share my second Verve Release Sketch card with you tonight. I really do love how this card turned out. I think it is such a soft and pretty card. It wasn't at all what I had envisioned but that's ok! :) I used my Verve set called "Meditations" and paired it with my Cosmo Cricket Everafter paper. I added some pearls and sponged the front panel for a more elegant look and then cut out some flowers for an added embellishment. This card is very simple overall. There isn't a lot to it even though it looks kind of busy. Well, have a wonderful evening! It's super late so we are off to bed! Today's card is one that I was not sure about at first but once I kept adding and looking at it, I have decided I really do like it! The sketch that I used is one from today's Verve Release Week sketch challenge! As you all know, I am completely obsessed with Verve's stamps so of course I am thrilled when they come out with more! :D Anyway, I used my newest set for this sketch called "Floral Symphony". This set is absolutely gorgeous and so versatile! I just can't get enough of it! I paired it with my new Cosmo Cricket paper called "Girl Friday". I love how girly this paper looks. It is definitely my kind of paper! I wanted to showcase my girlyness by adding some bling so I attached some pink rhinestones and put stickles on the flowers. I also added a touch of ribbon to the side of the image and paper pierced along the dp layer. Well, I think the rest of this card speaks for itself but if you do have any questions, let me know! Oh how great our Savior is! His mercy never ceases to amaze me! Happy Easter everyone! I hope you all have a very blessed day! :D May it be filled with love and joy. Let's remember why we celebrate Easter and enjoy the time that we have to celebrate Christ's resurrection! ((Hugs)) to all! This card was made for Julee's Mojo Monday sketch challenge as well as this week's SCS Inspiration Challenge. I chose to be inspired by this outdoor set. I just loved all of the elements of the sketch! It is just fabulous! Anyway, I knew I wanted to use my Verve "Everlasting Life" set so I paired it with my brand new Cosmo Cricket "Everafter" paper. I paper pieced the cross and colored in the grass with my Sage Shadow marker. I then ran my glitter pen over the sentiment and the grass. The corners have also been paper pierced and I attatched 3 flowers that I had colored with my SU! markers. Well, that's it for today. Sorry to keep this post short but I don't want to keep you too distracted today! ;) Have a fantastic day! Questions, Answers, and an Award! Happy Saturday! I don't have a card to share just yet but I promise that one will be posted later today. Anyway, some of you have had some questions lately so I decided to take the time to answer those. Q: Where you can find the Almighty God stamp that is used in this post? A: Patter Cross designed this stamp and I actually won it as blog candy but I know that you can purchase it from Unity Stamp Company. Here is the link this specific stamp. Q: What do you use to hang your punches? See the post being referred to here. A: Nick and I actually found some short little towel racks that fit my cupboard door perfectly. We picked them up at Ace. I am not sure if you can find them at Wal-Mart or not. If I remember correctly, we struggled to find some that were short enough. The ones we finally purchased are about 12" long. If you have any more, feel free to ask! Before I go I also wanted to mention this fun award that my sweet friend Kristin gave me! Good morning everyone! It is Friday and I so very thankful for that! I just love being able to wake up, help my husband get ready for work, and then still have time to clean my house before I sit down to start my blogging! :) Ever since going to the Dominican Republic I have also been converted into a coffee drinker so I love to have my Friday cup of coffee as well! I am looking forward to my day because it is already turning out to be just beautiful! I have big plans to clean up my yard this afternoon once it warms up a little more! Make sure you stop by Taylor's blog to see today's sketch. Taylor has also picked Joan Ervin for this week's featured sampler! Check out her blog too! So were you starting to wonder if I had disappeared again? Well, to put it mildly, we had another rough week. Nick's aunt passed away early Tuesday morning. She lost her battle of breast cancer at the young age of 41. It's hard to believe how quickly her cancer progressed but we know that God had His hand in it. She was a faithful servant and is now sitting at His feet. How amazing that would be! Anyway, knowing that does make it a little easier but our hearts are still heavy. Please pray for her family. She had a loving husband and two fabulous children who are grieving. Hello everyone! I am sorry for another late post this evening. I tend to get really busy after school and neglect my blog. I suppose that's ok though. :) Anyway, I wanted to share this card that I created yesterday afternoon. I saw Julee's Mojo Monday sketch from last week and thought it was a really great sketch. I used my new stamp set from Verve called "Everlasting Life". I actually won this set from the last release party! Thanks Julee! :D Anyway, I think this set is one of my very favorite sets yet. It has the most beautiful images and sentiments. You will have to check it out! To begin I stamped the image on whisper white card stock and colored it in with my ink pads and blender pen. I then stamped the image again so that I could color the blossom and pop it up on dimensionals. 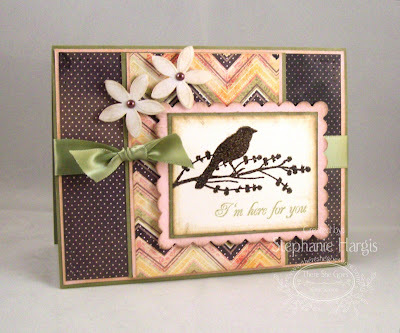 I used a Kraft base and layered on some of my Parisian Breeze dsp from Stampin' Up! I then added the sentiment (from the Serenity set) and popped it up on some dimensionals. For the finishing touches I added some pearls and ribbon. Well, that's it for tonight! I am going to try going to bed EARLY! :) Enjoy your night! Good evening everyone! Sorry for the late post but we had some of our wonderful friends over this afternoon and I am just now sitting down to my computer! Anyway, I made this quick and easy card yesterday afternoon and was going to share it then but we ended up going on a grocery trip instead. For this card I used my newest Unity stamp that was designed by Patter Cross called "Almighty God". I just love this stamp because it includes all of the different names of our God. :) I used the Unity sketch challenge that you can find over on SCS and paired it with my Cosmo Cricket dp. I wanted to give the card a vintage feel so I went over the edges of it with my sponge daubers and Tim Holtz Antique Linen distress ink. Well, I hope you like today's card. Sorry the picture is so dark but I didn't have the best lighting even with my photo tent! Enjoy your night! Am I the only one who struggles to get back into stamping after being gone for so long? I don't know why it is but I haven't even touched a stamp in over 3 weeks and now that I can, I don't even know where to start. Anyway, Taylor's sketch for this week is what got me started. I checked the sketch, sat there and stared at my supplies for what seemed like forever, and then finally tried to get creative. I got my new Verve Stamps in the mail while I was away and wanted to use them and since this sketch has a circle for the main image, I used my adorable little Plain Jane stamp! For the colors I decided to use this pretty paper from My Mind's Eye and pull out some colors from it. Overall I feel like this card is pretty cute but it is definitely not my favorite. I feel like something is either missing, or placed wrong. Make sure you stop by Taylor's blog to see today's sketch. Taylor is also starting the sneak peeks for her new release today and I know you won't want to miss them! Before I go, I wanted to let you know that Nick and I had such a great time in the Dominican Republic. It was so wonderful to get away. God really moved through me while I was there! We were fully submerged into the culture down there and feel like it was such a rich experience! We stayed with an amazing family and really enjoyed getting to know them! I will try to post some pictures in the near future.